Today I have one question for you: Are you hungry? Hungry to make a difference in the world… Hungry to bring awareness to a travesty right in our own backyard… Hungry to step up and do what is right; what is just. I know you are. So, join me and Team NAPW as we stand together and take action to wipe out hunger! June is National Hunger Awareness Month. And, our NAPW Local Chapters are stepping up to the plate, working with dedication, compassion and philanthropic spirit to feed the hungry and bring awareness to the overwhelming hunger crisis in our great nation, with hope to remove National Hunger Awareness Month from the calendar forever! Our Chapter Presidents and amazing NAPW professional women show their true colors of excellence, steadfast determination and unwavering generosity to do what is right and just in the world. I’ve said it before and I’ll say it again, I am proud and honored to be on Team NAPW! Take a look at their wide range of creative, heartfelt and unique Hunger Awareness initiatives. 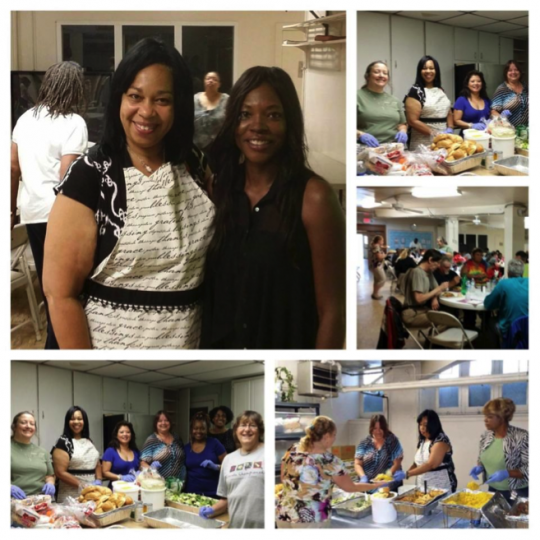 Serving it up in style, Chapter members donated hundreds of pounds of food to Chosen300 Ministries. They set up the dining room, prepped the meal and helped hundreds of hungry people in their area enjoy a great meal, maybe the only meal they had all week. In May, a devastating fire claimed the Simi Valley Chapter’s homeless shelter. Thankfully no lives were lost, but the entire shelter’s food storage facility and the delivery trucks were lost. Showing true team spirit, the Simi Valley Chapter joined forces with the Santa Clarita Chapter for “Thanksgiving in June” to collect food donations, help with the clean-up and create care packages for those in need. Their “Cooking for a Cause” networking event raised funds and canned food donations for the local Food Bank of the Southern Tier – almost 80 pounds worth! Going above and beyond with their Hunger Awareness initiatives, the Santa Clarita Chapter accepted the challenge – to “Live Below the Line” on $1.50 a day for five days. The “line” being the poverty line! Each Chapter member was required to eat three meals a day on only $1.50 per day – because that’s what people living in poverty have to spend for food, if that much! And, it’s what 1.4 billion people around the globe struggle with every day. In addition, to this brave challenge, Nicky and her team held “Food Pantry Mondays,” their local effort to combat hunger in their community. Each Monday NAPW members spent one hour at their local church pre-bagging food for the almost 300 (and sometimes more!) homeless people in the area. 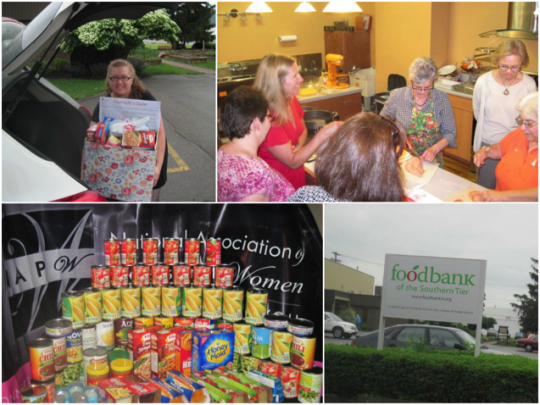 With American heartland hunger a growing problem, Kelli and her team hosted a networking fundraiser for The Foodbank of the Heartland. Their goal: to raise and provide enough funds to cover 450 meals, with just one dollar providing three meals. Yes, they took it to the (food) bank! “A Little Bit Goes a Long Way” was the motto as Chapter members only purchased food featuring the “Feeding America” logo, providing them the opportunity to enter a code so that funds go to the “Feeding America” campaign. Coast-to-Coast Food Drives included the teams of Chicago, IL Chapter President and Northern Regional Manager, Megan Wessels; St. Petersburg, FL Chapter President, Maurie Lung; Howard County, MD Chapter President, Heather Lysantri; Central Houston, TX Chapter President, Cathy Robertson; Lexington, KY Chapter President, Misty Dotson; Waldorf, MD Chapter President, Tammy Wright; and Kansas City Metro, KS Chapter President, Susan Freeman. Way to go Team NAPW! Absolutely amazing! Our Local Chapters continue to do me proud with their exemplary leadership, empowering influence and passionate dedication to philanthropic efforts. I am honored and privileged to lead such a diverse group of professional women striving to make a positive difference in the lives of women and girls throughout their communities and the world! I urge everyone to join a Local Chapter in your area today. You’ll feed your heart and soul by embracing your social conscience to do what is right and just alongside a phenomenal group of professional women. Here’s to you, our Year of Action and to wiping out hunger forever! How do you plan to bring awareness to the hunger crisis? Share your comments below.